One of your clients was scammed with the syskey password? Are you a victim of a “Microsoft Technical Support” Scam with syskey? SysKey is the built-in tool in Windows that can secure the Security Accounts Management (SAM), but it is used by scammers to lock victims out of their own computers. In this tutorial we’ll show you a workaround to remove Syskey (Startup Password) from your Windows PC. How to Reset SysKey After Technical Support Scam? Boot your computer from Windows installation media. When you see the Setup screen, press the Shift + F10 keys to open a Command Prompt. At the Command Prompt, run these commands to back up the registry hives and save them in a temporary directory, such as C:\regbackup. Next, run the following commands to copy all registry hives from the RegBack folder into the C:\Windows\System32\Config folder. Quit Windows Setup and reboot your computer. You’ve successfully removed SysKey from your PC and Windows will boot normally to the login screen. That’s it! Command Prompt has been around for decades, but starting with Windows 10 build 14971, Microsoft has replaced it with PowerShell in the Win + X menu. Luckily you can still easily bring the Command Prompt (Admin) option back to the Win + X menu in Windows 10. How to Add Command Prompt (Admin) Back to Win + X Menu in Windows 10? Right-click on empty spot of Windows 10 taskbar, and then select Taskbar settings from the context menu. Find the option “Replace Command Prompt with Windows PowerShell in the menu when I right-click the Start button or press Windows key+X” and toggle it to Off. Now, press the Win + X keys on your keyboard and you’ll see that the Command Prompt (Admin) option is back into the Win+X menu. Every time you run an application as administrator mode, the User Account Control (UAC) window will pop up asking if you’re sure you want to let this program make any changes to your computer. This could be really annoying especially if you try to run a trusted program. In this tutorial we’ll show you 3 ways to enable / disable UAC in Windows 10, 8 and 7. Press the Windows key + R shortcut to open the Run dialog. Type secpol.msc and press Enter. When the Local Security Policy window appears, navigate to: Security Settings -> Local Policies -> Security Options. Double-click the “User Account Control: Run all administrators in Admin Approval Mode” policy on the right pane. To enable UAC, you have to select the Enabled option. Or choose the Disabled option if you want to turn off UAC completely. Click OK and close Local Security Policy. Restart your computer for the UAC settings to take effect. Press the Windows key + R shortcut to open the Run dialog. Type regedit and press Enter. Double-click the EnableLUA on the right pane, change its value to 1 if you want to enable UAC. In order to disable UAC, you have to set it to 0 again. Open the Control Panel. Click the search box in the upper right corner and then type UAC and hit Enter. Click “Change User Account Control settings” from the search result. In the User Account Control Settings window, you’ll see a slider with four options. Drag the slider down to the bottom (Never notify) and this will disable UAC prompt completely, or drag the slider up to the UAC level you want. Lost Windows 10 admin password on your Panasonic Toughpad tablet? How can I recover the password without reloading Windows 10? Just take it easy! With the PCUnlocker software you can crack Windows 10 password easily on Panasonic Toughpad tablet. As the Panasonic Toughpad table comes with UEFI firmware, we need to create a UEFI/GPT bootable USB drive. To get started, download the PCUnlocker Enterprise and save the .zip file to the local hard drive of your current PC. Double-click the zip file and drag the pcunlocker.iso file and drop it to your desktop. Download the free USB creator software ISO2Disc. Launch ISO2Disc, then click the Browse button to select the pcunlocker.iso on your desktop. Choose your USB drive from the device list, then select the “GPT (required for UEFI boot)” option and click Start Burn. After one or two minutes, a UEFI bootable USB drive will be created. Plug the USB drive into the USB port of your Panasonic Toughpad tablet. Turn on the tablet while touching top left of the screen to enter the BIOS Setup Utility. After loading the WinPE environment from USB, the PCUnlocker program will start. It shows you a list of local accounts detected in the SAM file of your Windows 10 operating system. Choose the administrator account and click on Reset Password button. It will remove your forgotten Windows 10 password, as well as reset your account’s properties to default: unlocked, enabled and never expire. Reboot your tablet and unplug the USB drive. You can then sign into your Windows 10 admin account without a password! How do I factory reset a Windows 10 computer with an unknown password? If you use a Microsoft account sign-in, you can reset Windows 10 Microsoft account password online using another working PC. If you forgot a local user password, you might be stuck at the login screen. Here we’ll show you a workaround to reset Windows 10 computer to factory settings from the login screen, without knowing the admin password. How to Reset Windows 10 PC to Factory Settings without Logging in? From the login screen, click the Power icon at the bottom right corner of the screen. Hold down the SHIFT key on your keyboard and select the Restart option. Release the SHIFT key when you see the “Please wait” message on the screen. The system will reboot and bring you to the Choose an option screen. Click on Troubleshoot. On the next screen, click on Reset this PC. Now it will prompt you to choose either “Keep my files” or “Remove everything“. If there is no important files or you have backed up them on to external disk drive, you can click “Remove everything”. Next you have another two options: Just remove my files, Fully clean the drive. The latter option will format your hard drive and erase all the data securely. Click on Reset. It will begin to reset your Windows 10 computer to factory settings. This process will take at least half an hour, depend on your computer’s performance. Stuck in an endless loop with Safe Mode every time you turn on or restart your computer? If Windows 10 continually boots directly to Safe Mode and you can’t make it stop, take a look at this tutorial and you can get your Windows 10 computer out of Safe Mode easily. How to Get Windows 10 Out Of Safe Mode? Step 1: Open an elevated Command Prompt in Windows 10, by pressing Windows key + X and select “Command Prompt (Admin)” from the WinX menu. Step 2: Type the following command at the Command Prompt and press Enter. Step 3: Now you’ve turned off Safe Mode successfully. Reboot your computer and Windows 10 will boot directly into normal mode instead of Safe Mode by default. Forgot your Windows 10 PIN login? Have problem with PIN sign-in option and you want to remove it? In this tutorial we’ll show you 2 simple ways to remove forgotten PIN login in Windows 10. Open the Settings app by pressing the Windows key + I on your keyboard, or click Start button and select Settings. Once the Settings app launches, click Accounts. Next click Sign-in options on the left pane. Scroll down to the PIN section and click Remove button. Enter the password of your local account or Microsoft account, and click OK. Once your typed password is verified, it will remove your PIN login immediately. Delete all files/folders inside the NGC folder. To do so you have to be logged as Administrator and grant full permission to your account using TakeOwnershipPro. Now log off your computer or restart. You’ll find that your previous PIN login has been removed from Windows logon screen. That’s it! After removing the PIN login, you should be able to set up a new PIN. These two methods require you to log on Windows 10 as administrator. If you’ve forgotten the password of local administrator account or Microsoft account, you can reset the password with PCUnlocker boot media. If you can still log into Windows 10 with your Microsoft account, you can switch it to a local account from the Settings app. But what if Microsoft account is the only sign-in option but you forgot the password? In this tutorial we’ll show you a simple way to switch a Microsoft account to a local account when you’re locked out of Windows 10 computer. When you’re locked out of Windows 10, you have to use another computer to create a boot CD. 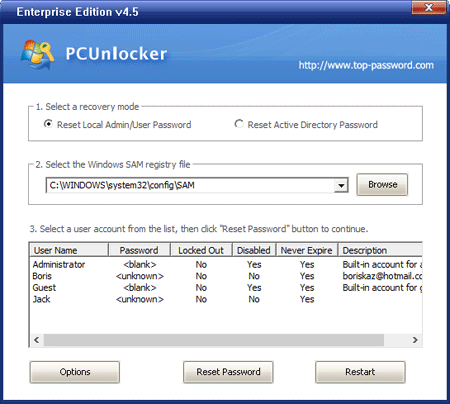 Download the PCUnlocker Enterprise and extract the ISO file. Burn the ISO file to a blank CD using ISO2Disc or your favorite disc burning software. If your computer doesn’t have a built-in optical drive, you can use ISO2Disc to make a bootable USB drive from the ISO file. After burning the PCUnlocker ISO file to CD, go to your Windows 10 computer that you can’t sign into with Microsoft account. Restart the computer from the CD. The PCUnlocker program itself will launch immediately after the booting process is complete. You can see a list of local accounts it finds on your Windows 10 installation. Your email address of Microsoft account should be displayed under the Description column of the associated local account. Select the associated local account and click Reset Password. The program will convert your Microsoft account to local account and removes the existing password. Remove the CD from your optical drive and restart your computer. Simply click the user icon at the login screen and you should be able to login without typing a password. As long as you can keep this CD in a safe place, you’ll never have to worry about forgetting your Windows password. If you’ve forgotten or lost your administrator password in Windows 10, you can reset a password by booting from a Windows 10 install disk. Here we’ll walk you through the steps to reset forgotten Windows 10 password with installation disk. Reset Forgotten Windows 10 Password with Install Disk? Boot your computer from Windows 10 installation disk. When the Windows Setup screen opens, press SHIFT + F10 key combinations to open the Command Prompt. At the Command Prompt, you can easily replace the sethc.exe file with cmd.exe. Just run the following commands one by one, replace d:\ with the actual drive letter of your Windows 10 partition. When it’s done. Cancel Windows Setup and eject the install disc. Reboot your computer. When your computer reboots to Windows 10 logon screen, press the SHIFT key 5 times in a row. The Command Prompt will open in administrative mode. Run the following command and you can reset your forgotten password quickly. Replace username with the name of your actual account, and newpassword with your desired password. Now close the Command Prompt and you’ll back at the login screen. You can login with your new password. Now you’ve successfully bypass forgotten Windows 10 password. How to gain access to Windows Server running RAID when the administrator password is forgotten? You might have tried methods like booting with Hiren’s BootCD, Ophcrack, but these boot CDs don’t have necessary RAID drivers to detect the RAID drive. 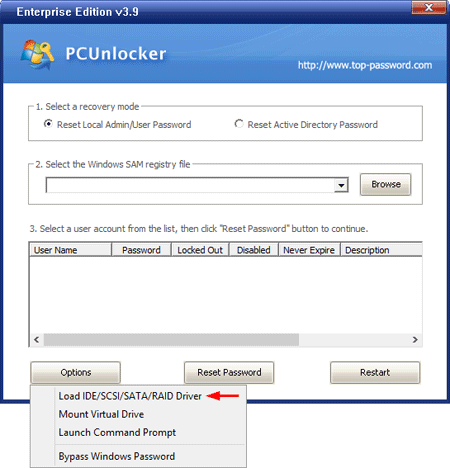 In this article we’ll explain how to use PCUnlocker to reset lost password for Windows Server by loading the RAID driver on the fly. 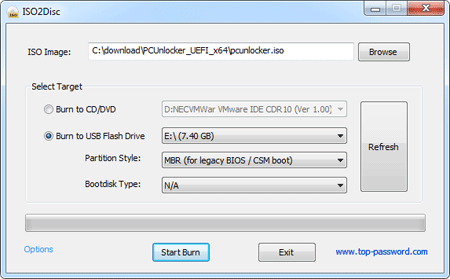 Download the ISO image of PCUnlocker Enterprise and save it to your current working PC. In order to make a bootable USB drive, you need to use the free USB creation software – ISO2Disc. Launch ISO2Disc and browse to select the PCUnlocker ISO file, choose your attached USB drive as the media and click on Start Burn. The burning process usually takes one or two minutes. If your locked server comes with UEFI firmware instead of legacy BIOS, you need to choose the “GPT (required for UEFI boot)” option while burning with ISO2Disc. Now you need to download the RAID driver in order to make your hard drive recognized by PCUnlocker. Go to the manufacturer’s website of your server to download the driver setup package. 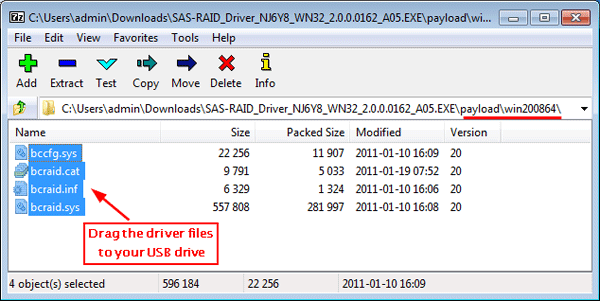 Most of the driver packages are in .zip or .exe format. Unzip the package with the freeware 7-Zip and save the output files to any folder of your USB drive. Boot your server from PCUnlocker Live USB drive. When comes to the main interface of the PCUnlocker program, you might see nothing is displayed on screen because your hard drive is not detected. Click on Options button and then select “Load IDE/SCSI/SATA/RAID Driver“. 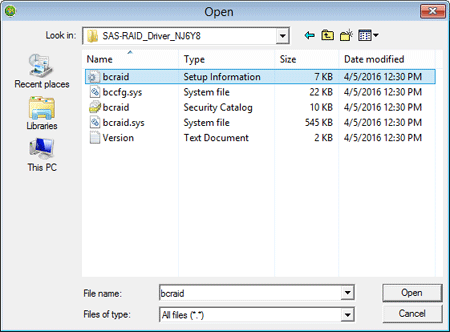 Browse to select the RAID driver that you’ve downloaded and stored in your USB drive. After the RAID driver is loading, you should be able to see the Windows user accounts in your server. Choose the administrator account and click on “Reset Password” button. It will remove your password as well as unlocking the admin account. Reboot the server and unplug the USB drive. Boot your Windows Server as normal and you can then log in to the admin account without typing a password! So this is how you can reset Windows Server password with RAID. It’s that simple!